INGREDIENTS: fortified wheat flour (wheat flour, calcium carbonate, iron, niacin, thiamin), water, palm oil, humectant (vegetable glycerine), sugar, raising agents (disodium diphosphate, sodium hydrogen carbonate), salt, onion purée, emulsifier (mono- and diglycerides of fatty acids), citric acid, red chilli purée, garlic purée, sunflower oil, dried red chilli, preservative (calcium propionate), chilli powder, ginger powder, black pepper, dried red pepper, lemon juice, rice flour, colour (paprika extract), wheat starch, flour treatment agent (L-cysteine hydrochloride). Pre-heat a dry frying pan. Remove all packaging. 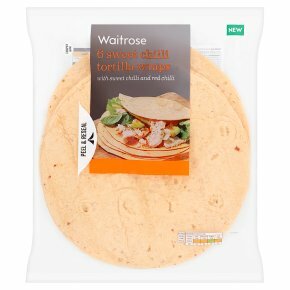 Place one tortilla onto the pan and heat for 15 seconds. Turn once during heating.